My better half took Friday off from work to hang out in the summery weather. 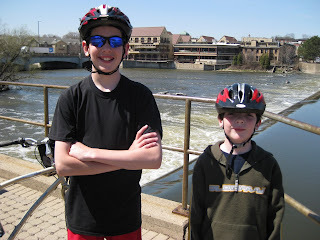 We headed off to go biking again along the Fox River trail for a short 10 mile ride from Batavia to St. Charles. This sculpture always greets us on the way through Pottawatomie Park in St. Charles. 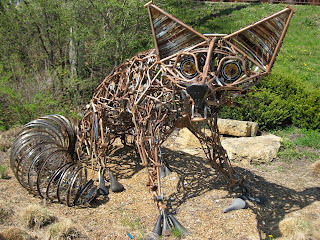 Meet Foxcycle, he's made entirely from recycled bicycle parts. We were lucky to have such a nice, sunny day on Friday. The kid's earned free tickets to a Kane County Cougars game on Saturday but we didn't get to see a game played as the rain and thunderstorms blanketed the area. 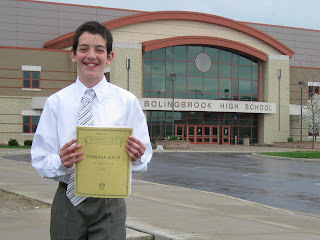 On Saturday my eldest participated in his first piano competition. He ended up with a silver medal for second place. He was surprised he placed as he has only been playing for a bit over a year now. He says now he's inclined to enter next year to strive for first place with a cash prize. It is amazing what this child can do when he motivates himself toward a goal. 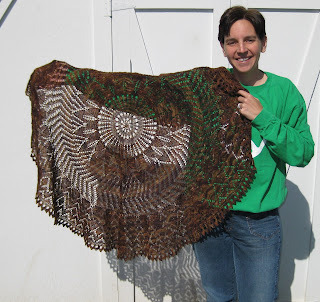 It started with a triangle shawl, the forest canopy shawl. I knit this in a beautiful green colorway from numma numma yarns at the end of February. Then I moved to a rectangle stole, the Woodland Shawl. It was in a bright, orange colorway from Fearless Fibers that brightened my dark March days. My love for knitting lace on these two shawls brought me to Girasole. 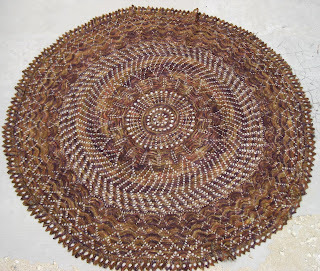 A circular shawl pattern with 7 different lace charts, a cast-on I've never tried, and a border that looked like it would take me a year to complete. I picked another colorway from numma numma yarns and cast on a couple of weeks ago. I finished blocking it over the weekend and it hasn't left my shoulders since. I was able to impress the man and boys of my house with this project. This lace knitting is addictive. I'm taking a break from lace for my next project, a cute, top down cardigan. But I've already printed out my next lace chart. It's a blanket pattern in bulky cotton yarn and I can't wait to cast on. 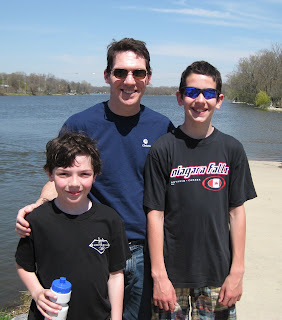 Today's weather was so nice we decided to spend the day along the Fox River. It was our first biking trip of the year. We packed our lunches. We each took a book along so we were able to lounge beside the beautiful landscape nature provided. What a fabulous way to spend a day! 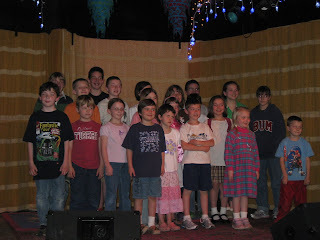 We made it back into town in time for the kid's to get together and recite poetry. The kids did a great job presenting their poems. I'm off to start dinner on the BBQ for the first time this season too. Wish me luck. You can take the girl off the farm but you can't take the farm out of the girl. 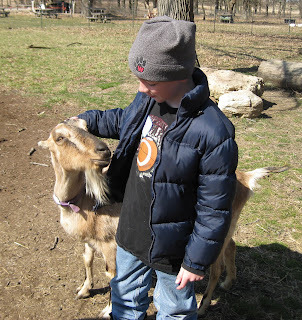 My kids had fun collecting eggs and seeing happy baby goats. 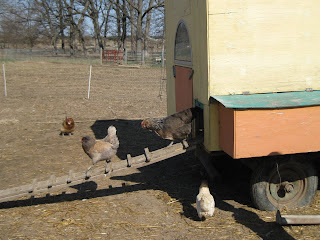 I'm headed back to this farm next month to take a "class" at their learning center with a friend of mine who now lives on a farmette. For now I only have one furry head to spoil. 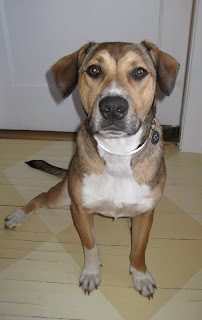 Our dog,Baxter turns a year old this month. We couldn't decide on a specific date for a birthday so April is birthday month for crazy pup.